now that my swappy package has safely arrived, i'm excited to be able to share it with all of you! i made this mini quilt for my secret partner, Michelle, in the For the Love of Solids swap. i just love the circle of flying geese block -- so fresh and modern. especially with the Kona solids! i wanted to try something new with my quilting so i decided to go with a straight-line+echo quilting combo. i'm really happy with the way the quilting turned out -- i plan to use it in more of my mini quilts. 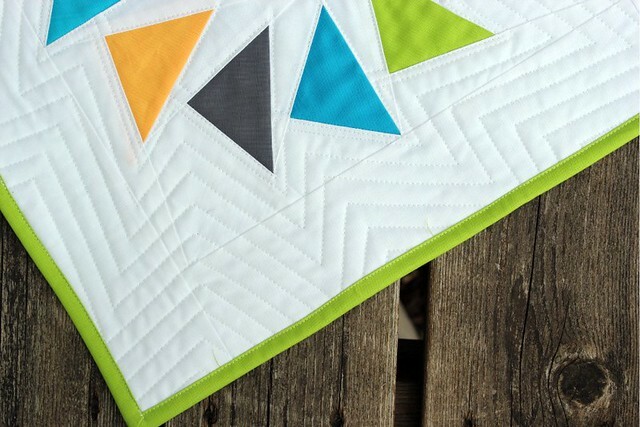 my favorite part of the entire mini quilt is that bright citrus-y green binding! this quilted mug rug rounded out the package. i've only tried improv piecing a handful of times but i'm really growing to enjoy it! shocker, i know. i chose to quilt it using 1/4" straight-line quilting and l love the texture it created in the corners! 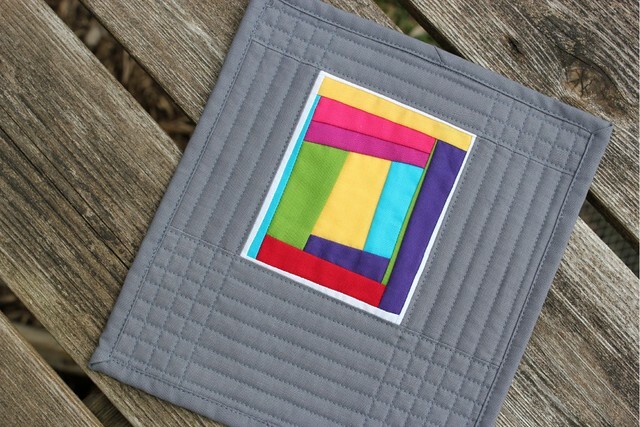 my raw edge pez quilt is being featured over on the Modern Quilt Guild blog today! i'm super excited they wanted to share it as a part of their 100 days of quilting. thanks, ladies! the weather here in Iowa has been *wonderful* these last couple of weeks. 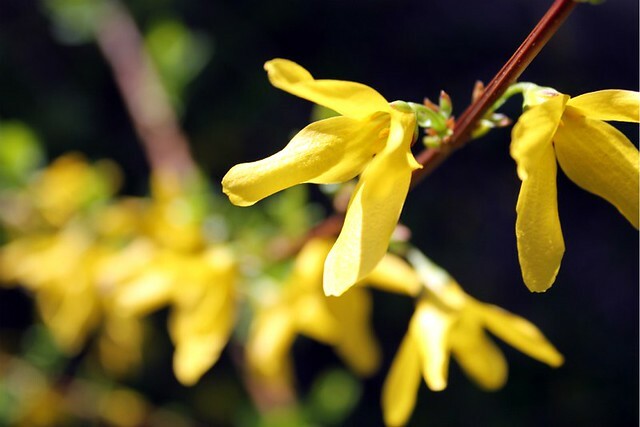 lots of sunshine, blue skies, and unseasonably warm weather. but hey, this girl isn't complaining! i love this time of year -- everything looks so fresh and green! have a great weekend, everyone! don't forget, the Festival of Half Square Triangles kicks off Monday -- and the prizes are awesome! Bravo! That mug rug is the coolest. I've been wondering how to quilt my Circle of Geese block and now I know exactly what to do, thanks for the inspiration! LOVE the way you quilted this! Fabulous swappy things! 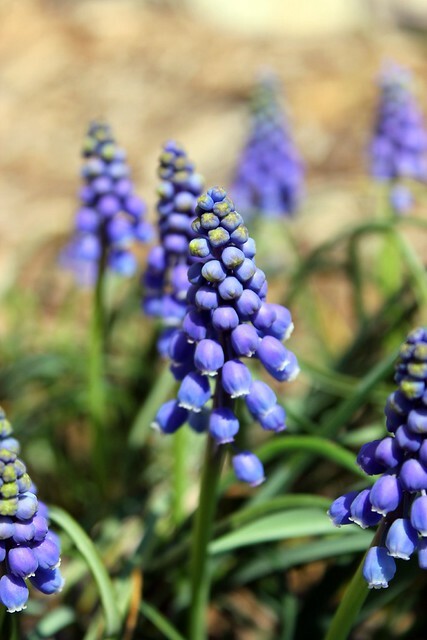 And congrats on being featured on the MQG blog! Gorgeous swap goodies! The colours, designs and quilting are so beautiful and inspiring. Congrats on the feature over at MQG blog! Woot! Woot! You are really inspiring me to get some solids!! last time I used solids it was for an Amish style quilt, big star, for a contest, I won 1st prize(but only two entries...) all hand quilted. Need to try some fun small things. Thanks for sharing!! 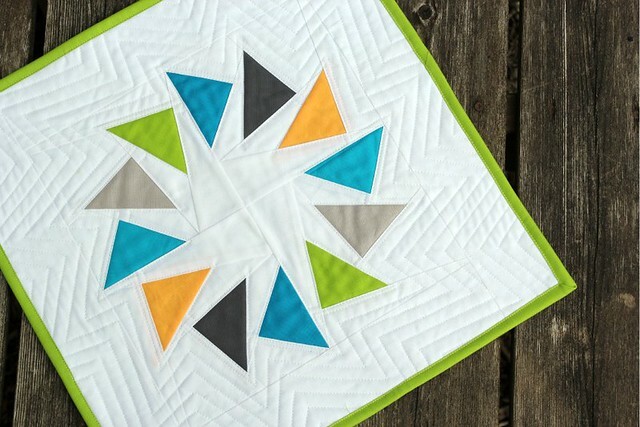 The quilting in your Circle of Geese is awesome! Love your FTLOS package, and congrats on the feature! Wow, your lines are soooo straight. Love them all. Megan, these two are beautiful! Love the quilting you did on them. Improv is fun, isn't it? You never know how it's going to turn out. I'm so lucky to have these 2 fabulous quilts living at my house! 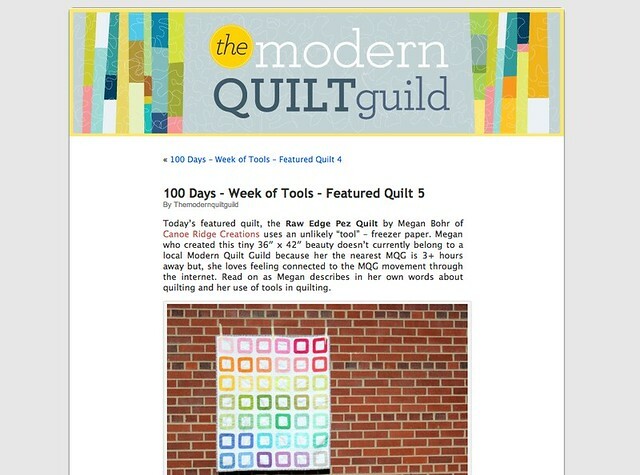 I get an email from the modern quilt guild and whose in it you! Congrats. Congrats on the Pez quilt honors. Your solid swap gifts are strikingly beautiful. Love them both!